Boerboel Characteristics: The powerful and courageous Boerboel is a breed of large dog classified as a member of the Working Dog Group. The Boerboel, is characterized by its impressive appearance with a deep, broad, square head and intelligent expression. Other characteristics include dark, widely spaced, medium sized eyes; flat, broad, V-shaped ears and a fluent, powerful gait. The temperament of the Boerboel can be described as Dominant, Obedient, Confident. The coat type of the Boerboel is described as short, smooth coat in assorted colors. Due to its characteristics and qualities, the Boerboel demonstrated the desired traits of a Watch dog, Herding, Fighter & Guard Dog and is known by its nick name the "Dog of the Boers". The origin of the Boerboel dog breed was in South Africa where it was developed in the mid 1600's. Boerboel Breed Group and Dog Type - Working Dog Group: The Boerboel is one of the many breeds of dogs that belong to the Working Dog Group. Origin of the name Boerboel: The name 'Boer' was given to the Dutch colonists and farmers in South Africa who used the breed to protect their homesteads and was later used to guard the diamond mines. The word 'Boel' was an Afrikaans word meaning "A lot of dog". Boerboel History and Origin: The country of origin of the Boerboel breed was in South Africa during the mid 1600's when the Dutch East India Company established a permanent settlement at the Cape Colony in 1652. The Dutch settlers developed the breed from the mastiff-type dogs and the, now extinct, Brabanter Bullenbeisser (also known as the Bull Biter) that they brought with them from the Netherlands. (Refer to History facts and info about all the Mastiff breeds). The Dutch settlers, the Boers, used the huge dogs for hunting and for protecting their homesteads and their wagons against the indigenous tribes of South Africa. The Boerboel was used to accompany the Boers on hunting expeditions for gazelles and wild oxen. They were also known to hunt lions and leopards. The muskets of the period were inaccurate and the Boerboel was trained to track, chase and hold down the game until the human hunters arrived. The Boers were hostile towards indigenous African people, with whom they fought frequent wars. The Boerboel was used as fighting dogs and for protection against their enemies. In 1867 diamonds were discovered in the Cape Colony and the diamond mines of Kimberley produced 95% of the world's diamonds. Security at the numerous diamond mines in South Africa was of premium importance and the Boerboel was used as a guard dog against thieves. During the 1920's the DeBeers mining company imported more European mastiffs to the mines and these were cross bred with the Boerboel in an effort to produce bigger and more ferocious dogs. As time passed the security systems at the mines became more sophisticated but dogs were still used to guard the diamond mines. In 1983 the Boerboel Breeders Association was established to protect the original Boerboel breed. 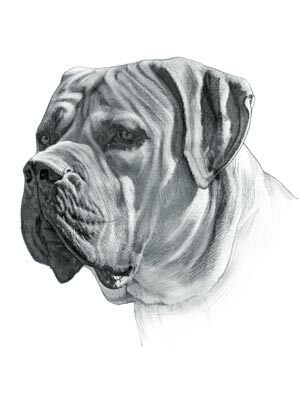 Boerboel Modern History: The modern history of the Boerboel moved on and the breed is now used as a Watchdog, Herder and as a popular guard dog, especially in South Africa. The Boerboel was officially recognized by the American Kennel Club (AKC) in 2015. Boerboel Height: The Boerboel breed is classified as a large sized dog. The height to the shoulder of a male dog is 60 to 70 cm (24 to 28 in). The height to the shoulder of a female dog is slightly less. Boerboel Weight: Not surprisingly for a large sized dog, the weight of a Boerboel male dog is 50 to 100 kg (110 to 220 lbs). The weight of the smaller female dog is slightly less than the male. Boerboel Coat Type: The coat type is described as a short, smooth coat. Boerboel Coat Colors: The colors of this dog breed consist of assorted colors consisting of Cream, Brown, Mahogany, Red, Fawn, Brindle and Piebald. (N.B. The term "Red" refers to reddish shades of orange, brown, and tan colors. Brindle is a brownish or taw ny color whereas Mahogany is a strong reddish-brown color. Piebald are irregular patches of two colors, typically white and black and white). Boerboel Grooming - LOW Grooming Needs: The grooming needs of the Boerboel are categorized as Low in order to maintain a healthy coat and reduce the risk of skin infections. The limited grooming needs of the Boerboel are considered to be low maintenance, requiring limited attention to grooming where brushing and combing, is concerned. Grooming Requirements should include bathing the Boerboel on a monthly basis and making regular inspections of the nails, teeth, eyes and ears. Boerboel Litter Size: The litter size of this dog breed ranges from 10-12 puppies. Boerboel puppies for sale can be obtained reputable breeders and from rescue centers. The cost of Boerboel puppies varies depending on location, pedigree history and the dog breeder. Boerboel Temperament and personality: The temperament and personality of the Boerboel dog breed is described as Powerful, Dominant, Obedient, Confident and Courageous. Boerboel Diet: A fully grown Boerboel should be fed twice a day. A diet consisting of a premium dog food can be balanced with fresh food eaten by the family. The question is What Can Dogs Eat?. Check out our comprehensive list of what dogs can and what dogs cannot eat. Boerboel Health Problems: Potential health problems of the Boerboel breed have shown no recurring problems. Resolving health problems can prove to be expensive and it is always wise to obtain pet insurance or dog health insurance when buying a dog. Is the Boerboel dog breed said to be Hypoallergenic? Answer: No. Boerboel Lifespan: The life expectancy of dogs vary according to the size, breed of dog and any serious health problems. The typical lifespan of the Boerboel breed is 10 - 12 years. Boerboel Male Dog Names: Male Dog names are most often chosen to reflect favorite names of the owner or the strength, size, coloring and country of origin of the Boerboel breed. To give you some inspiration regarding good male Boerboel names our small selection might be of help with naming boy dogs. Our top male dog names are: Ben *** Cain *** Josh *** Rufus *** Max *** Buddy *** Ezra *** Festus *** Duke *** Lucky *** Sam. Boerboel Female Dog Names: Female Dog names tend to be softer, prettier and reflect the temperament of the Boerboel girl dog. Our top choice of good female Boerboel names are Velvet *** Abby *** Candy *** Juno *** Bella *** Cinders *** Empress *** Chloe *** Sophie *** Mara *** Persis.